About Michael | Partnering Design Inc.
Michael’s depth of experience, both in business and in life, gives him a unique perspective and ability to relate to the multifaceted challenges of modern life. 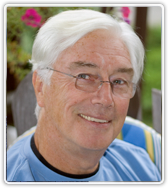 Mike has founded or cofounded five successful businesses in publishing, training, management consulting and coaching. He has been married to Raymonde since 1980, has a grown son from a previous marriage and one grandchild. He brings you a lifetime of personal development experiences including in-depth training with the leaders in executive and personal coaching. Mike’s clients describe him as dedicated, warm, insightful, funny, direct, and kind. Formal education: Lakefield College, 1962. Present: President and owner of Partnering designs inc. Located on the Sunshine Coast, BC. Engaged in business / personal coaching with clients across Canada. 2004 – Co-founder and president of Better Planet Productions Inc. Creators of EarthCare an energy conservation education program, to school districts in Ontario. 1995 – Founded Partnering Designs Inc. specializing in partnering strategies for business and public sector. Co-creator of the Better Schools Partnership; a strategy for leveraging operational savings to generate over $500k in capital for school renewal in schools districts across Canada. 1981 – Co-founder and President of Managerial Design Corporation. Offering organizational effectiveness consulting, strategic planning, performance management, and process management. Managerial Design is now part of Deloitte Canada. 1974 – Co-founder and Managing Director, Canadian Training and Development Group Inc. President, Success Motivation Institute div. Offered management, supervisory and sales training through a network of over 60 franchised distributors across Canada. 1962 – Industrial Supervisory Institute Ltd. Started in the mail room, moved into to sales, sales management, copywriter, editor, and eventually President. Bought the company in 1973. Personal Interests: Golf, yoga, guitar. – Newfield’s Certified Coach Training. University of Calgary. – Strategic Intervention Coaching: Robbins-Madanes Institute, California.